ISR-affiliated Professor Peter Sandborn (ME/ISR) is one of four authors of Strategies to the Prediction, Mitigation, and Management of Product Obsolescence, a new book published by Wiley. 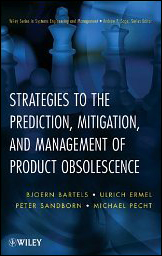 Sandborn wrote the book with Michael Pecht, director of the University of Maryland's Center for Advance Life Cycle Engineering (CALCE); Ulrich Ermel, Project Manager for Obsolescence Management in the TQ-Group, Germany; and Bjoern Bartels, senior consultant and obsolescence management competence lead at ABSC GmbH. Supply chains for electronic products are primarily driven by consumer electronics. Every year new mobile phones, computers and gaming consoles are introduced, driving the continued applicability of Moore's law. The semiconductor manufacturing industry is highly dynamic and releases new, better and cheaper products day by day. But what happens to long-field life products like airplanes or ships, which need the same components for decades? How do electronic and also non-electronic systems that need to be manufactured and supported of decades manage to continue operation using parts that were available for a few years at most? This book attempts to answer these questions. It is the only book on the market that covers obsolescence forecasting methodologies, including forecasting tactics for hardware and software that enable cost-effective proactive product life-cycle management. The book describes how to implement a comprehensive obsolescence management system within diverse companies. It is useful for all professionals in product/project management, sustainment engineering and purchasing.